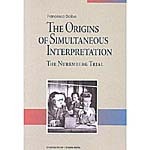 I recently read a book titled The Origins of Simultaneous Interpretation: The Nuremburg Trial that I thought I would recommend given that the pool of information regarding the history of interpreting can be somewhat limited, or difficult to find. Written by Fracesca Gaiba, Origins describes how the Nuremburg Trial, conducted from November 1945 to August 1946, was the first international gathering in which simultaneous interpretation was used. Gaiba recreates the events that brought simultaneous interpreting to the court system through a combination of interviews with Nuremburg interpreters and staff, as well as extensive literature and audio review of resources pertaining to the trial. Four languages, English, French, Russian, and German were used throughout the trial. Every listener in the courtroom was equipped with a headset and a selector switch at his or her seat. The listener could then choose one of five “channels” he or she wanted to listen to during the trial: the verbatim speech, English, French, Russian, or German. When a French prosecutor was examining a German witness, for example, the prosecutor asked a question in French. The witness heard the German translation through the earphones and answered in German into the microphone. The prosecutor heard the answer translated into French and replied in French, and so on. At the same time an English-speaking listener heard the English version of both questions and answers (p. 61). Finally, the division discovered that many linguists with excellent academic backgrounds could not do the job because, even though they could translate Schopenhauer, they could not cope with subjects like toilet arrangements in concentration camps. Basically, the division discovered that few, very few, people could do simultaneous interpreting. Alfred Steer who in a year tested more than 400 people, calculated that only five percent of the people tested, including experienced consecutive interpreters, could do simultaneous interpreting. More than 200 people were tested before the trial to obtain the first 36 interpreters. In all, more than 500 sat for the interpreting test during the trial. Soon after the testing started it was realized what a difficult task was required of a simultaneous interpreter (p. 48). And you thought it was hard to pass the Federal Court Interpreter’s Certification Examination! All kidding aside, this book is a great read that demonstrates the level of technique and skill needed to accurately perform simultaneous interpreting. Origins provides us with a perspective on the Nuremburg Trial which will be fascinating to any interpreter or language professional.